What's your tea party story? I was thinking the other day about the extraordinary chain of events that lead to me being involved in the Tea Party movement. I had been a singer/songwriter for years in the music business. Ten years ago, this led to an Orlando based entertainment company offering me the job of my dreams. Mary and I sold our Maryland home and moved to Orlando, FL. A few months after our arrival, we realized the job offer was a bust. We were on our own. We decided to stay and try to make a go of it in Florida because there was nothing waiting for us back in Maryland. It was extremely difficult. I tried to make ends meet by singing wherever I could, including biker bars. The whole experience, especially the biker bars, was like going to entertainment school. Folks, trust me when I say, you really want to keep bikers happy. I also worked construction. One day while working, I heard on the radio that an Orlando radio station was hosting a Troop Support rally. Against the advice of talent agents, I have always been outspoken about my patriotism and gratitude to our military. I called the producer of the Orlando rally to ask if I could perform/sing. Amazingly, this guy who did not know me from Adam said "yes." It was a God thing. My original "Celebrate America" was a big hit at the rally. The Orlando rally led to me performing at a huge Glenn Beck rally for our troops in Tampa. Then, G. Gordon Liddy asked me to perform at his rally for our troops in DC. I was asked to return to DC to perform at a Gathering of Eagles rally for our troops. At the GOE rally, with several thousands in the audience, their CD player malfunctioned and would not play my accompaniment music. The song was my original 9/11 tribute titled "United We Stand." It is a huge production with several backup singers. When the CD player would not work, someone in the audience yelled, "Sing it without music!" The situation forced me to perform the song a cappella — slower and heartfelt. The audience was extremely moved. Another God thing. Little did I know that Joe Wierzbicki of Our Country Deserves Better PAC was in the audience that day. Joe sent me an email introducing himself and invited me to go on their national Stop Obama Tour. Later, OCDB PAC asked me to go on their Tea Party Express tour. And the rest, as they say, is Tea Party history. So all of this began with me making ten bucks an hour working construction and hearing a commercial about a local troop support rally. God is awesome. Folks, in my travels on four nationwide Tea Party Express tours, I have heard countless similar stories from patriots about how God orchestrated circumstances that directed them to get involved in our extraordinary, divinely-inspired movement. A senior patriot in Buffalo NY told me, "I had both knees replaced. I was stuck at home healing. I've been sick of the liberal garbage in our local newspaper. So, I decided to start a conservative newspaper." Her newspaper is extremely popular. I met a patriot who was a former commercial airline pilot. A back injury ended his career. He has always been passionate about the U.S. Constitution and U.S. history. He works full-time traveling the country lecturing and speaking at Tea Parties. Laid off his regular job, a patriot began producing films about tea party issues. He is using his passion for film to save his country. Even though survival has been challenging, he is happy and fulfilled. A gentleman humbly said, "I am not really involved in the movement. All I do is write letters to Congress, The Senate and etc three hours a day." Wow, that is what the tea party is all about, everyone doing what they can. Former Democrat House majority leader Nancy Pelosi tried to portray the tea party as heavily corporate funded Astro Turf. Actress Janeane Garofalo said the tea party is a bunch of redneck racists against a black president. 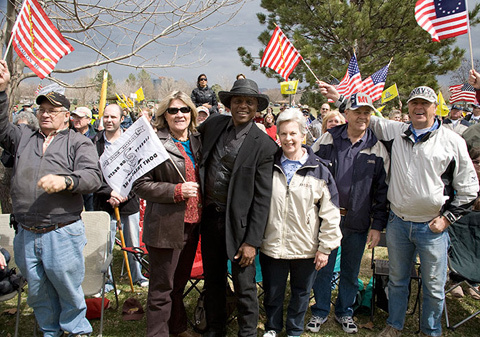 The NAACP officially proclaimed the tea party racist. 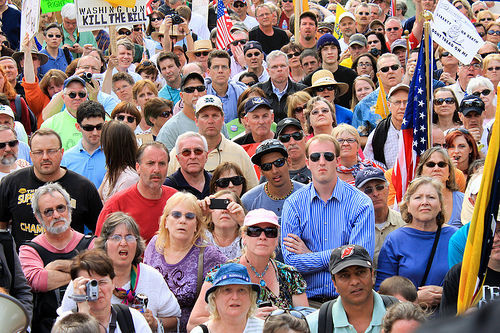 Even Obama himself said our tea party movement is motivated by race. All of them are wrong. We are an ever increasing army of ordinary Americans of all races who love our country. Horrified, we are witnessing Obama's daily assaults on our freedoms, fulfilling his vow to "fundamentally transform America." Patriots are politically fighting back to save America — following their individual passions and using their gifts and talents in various areas of expertise.